Citizens Advice Manchester has an amazing team of volunteers who give up their time, energy, resources and skills to help provide a service to the people of Manchester. Whatever your experience, skills or interests we can offer a role that will give you the chance to meet new people, learn new things and make a difference to the people around you. Our clients come from range of backgrounds, cultures and abilities and so it is important to us that our people do too. It means that we have volunteers from all walks of life, adding to the diversity of our organisation and bringing their experiences to benefit us and the people we support. We offer excellent progression opportunities, free training and the opportunity to undertake a recognised qualification. There are a number of ways you can get involved with Citizens Advice Manchester and this includes digital advice, initial advice, campaigns or events volunteering. See below for more information. Our Digital Assistants, working from our digital access points across the city/local job centres, support clients to use computers to access online information and self help resources, directing them to further advice if needed. For more information visit our Digital Advice page. Our Events volunteers act as ambassadors and champions for the work that Citizens Advice Manchester do, getting out into the community and letting people know about the services we offer. Volunteers will be largely based in one fixed location on a weekly basis, but will also have the opportunity to support ad hoc public events. For more information visit our Events Volunteer page. 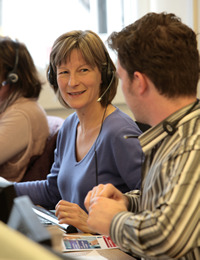 Telephone Triage Assessors provide a crucial service to the bureau. Acting as a first point of contact, for clients who call our telephone Adviceline, they make an initial assessment of the client's needs in a short interview. They talk clients through basic information such as fact sheets and self help information on our Advice Guide website, and when the client needs further advice, discuss they steps they need to take to get this. For more information visit our Telephone Triage Assessor page.